I am trying to design a 3 stage amplifier using transistors, 2 pre-amp stages using class A configuration and an output stage class AB. I have built the class ab amplifier with a darlington configuration and 4 diodes for the bias voltage and it has a gain of about 0.8v but now I am trying to calculate the input impeadance of the ac model so that I can design the 2nd stage but I am having some issues with finding the input impedance since I do not know how to calculate the transconductance with a darlington configuration. Samwel Portelli is a new contributor to this site. Take care in asking for clarification, commenting, and answering. Check out our Code of Conduct. On a single bipolar, wiggling the base by 18milliVolts will cause a 2:1 variation in the emitter (and collector) current. The GM (transconductance) is Iemitter(amps)/0.026volts. At 26milliAmps, the GM is ONE (amp/volts). For a Darlington, the GM will be affected by resistance shunting the base-emitter of the high-current device. And the frequency (as transient charging current plays a role). Try a 1Kohm resistor paralleling the EB junction of Q4(high current device), and the same for the PNP device. For more power, consider 100 ohms, or whatever keeps the low-current device in "relative constant current" operation. Comment: Of course, the parameters h11 and gm depend on the quiescent DC currents through both transistors. Remember: h11=h21/gm and gm=Ic/Vt (Vt: temperature voltage). (B) The total small-signal input resistance must take into consideration the resistors R1 and R2 as well as the dynamic (differential) resistances of the 4 diodes (which are determined by the DC current through the diode chain). More than that, the emitter resistor R3 provides negative feedback and, hence, increases the overall input resistance of the Darlinton configuration. Samwel Portelli is a new contributor. Be nice, and check out our Code of Conduct. Not the answer you're looking for? 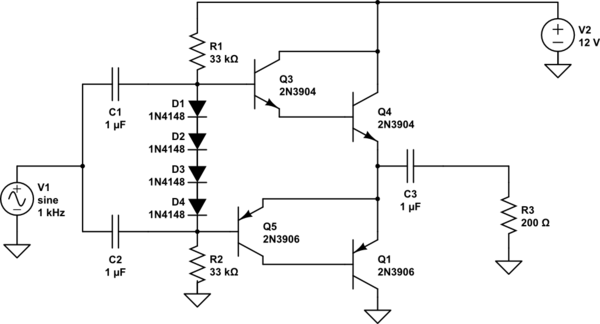 Browse other questions tagged transistors amplifier or ask your own question. What is meant by “input/output impedence” of a transistor stage in amplifiers? What class of audio amplifier is this unusual configuration?